Pond skimmers are a fantastic way to keep your ponds surface water clear of debris and leaves. However, choosing the best pond skimmer can be difficult as they come in many shapes and sizes. This article explains the advantages and disadvantages of different skimmer types, and provides pond skimmer reviews for the best skimmers available. Pond skimmers are designed to collect floating debris, such as leaves, which can contribute to waste build-up. A pond skimmer is designed to literally skim the surface of your ponds water, collecting floating debris and leaves. Floating debris will eventually sink after becoming waterlogged, and will later start to decompose on the floor of your pond. Small amounts of decomposition in a pond is generally harmless, but problems arise when organic material is allowed to build-up over time. 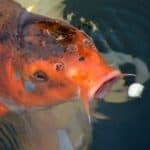 During the decomposition process, chemicals such as ammonia and nitrites are released, which, in high levels, can be very dangerous to fish, including koi. Along with the dangers to fish, decomposing matter can leak organic colors into water (called tannin), as well as create a breeding ground for harmful pathogens and bacteria as water quality degrades. The majority of organic matter that ends up on the bottom of your pond comes from sunken leaves, which began floating on the ponds surface. A pond skimmers job is to remove any floating debris, including leaves, for easy removal from a built-tin collection basket. If your pond is located near a heavily planted area with trees and shrubs that drop leaves annually, a skimmer can be a life-saver when it comes to clean up! Finally, most large pond skimmer boxes often come with the added benefit of additional mechanical & biological filter media, which provides extra water filtration during the skimming process. Although this is certainly not a requirement when choosing a skimmer, especially if you already have an efficient filter system, it’s always nice to have more water filtration for maximum ammonia reduction and peace of mind in heavy stocked ponds where you’re constantly at battle with waste production. Pond skimmers commonly come in three forms; pond skimmer boxes, submerged surface skimmers, and floating pond skimmers. Each have their positive and negative aspects, and the choice would depend largely on personal preference, size of your pond, and your ponds design. As the name suggests, a floating pond skimmer literally floats on the surface of your pond, collecting floating debris as it moves with the water flow. This is a good choice of skimmer for smaller ponds as no extra plumbing is required. Floating skimmers usually come with pumps built into the unit, so you can literally just drop them into the water and let them get to work. They require more frequent cleaning, however, and will not be ideal for larger ponds. A box skimmer sits with its mouth at water level so it can skim the water surface. These skimmers usually have a large basket to collect debris, and need to be dug into the banks of your pond and then attached to your pond liner. Box skimmers are an attractive option for larger ponds and fish stocked ponds due to their high skimming capacity. A final skimmer option sits between a floating skimmer and a box skimmer in terms of design. A submerged pond skimmer will be placed on the bottom of your pond floor at a certain depth, with the lips of the skimmer just touching the water surface. The skimmer will be attached to a pump, which then draws water into the skimmer from the center of your pond. 1) How durable is the product & collection system? A pond skimmer must be durable and be able to work effectively under all weather conditions. The problem with some low quality pond skimmers is the plastic can be very fragile, and during colder winter months, can begin to crack. Some pond skimmers also have very weak debris baskets that tend to break and tear during removal, so a sturdy collection basket is essential. 2) How easy is maintenance & cleaning? Since a pond skimmer can’t clean itself and will often require frequent emptying, having a skimmer with an easy to use and quality basket system is essential. The pond skimmer should also be easy to access by hand, with the basket or debris chamber being a good capacity for your individual needs (i.e, a larger basket would be preferable for a pond with heavy leaf fall). 3) What pond skimmer pump is required? To ensure you can run your pond skimmer efficiently, you will need to purchase a skimmer to match your pump or a pump to match your skimmer! For example, if you have a pond pump with a flow rate of 3,000 GPH, your pond skimmer will also need to support a flow rate if of 3,000 GPH or lower. If your pump is too strong it can damage the skimmer and the flow will be too fast for the skimmer to work effectively. If the pump is too weak, there will not be enough flow to catch debris and the pump motor can burn out. If you need some help choosing a reliable pond pump, check out our recommendations here! 4) Is the skimmer safe for goldfish & koi? If you have a fish stocked pond, you will need to make sure there is some kind of floating door in the front of the intake. This will prevent fish entering and being sucked down into the basket chamber. In most cases, fish that become sucked into skimmer boxes won’t be harmed as the collection baskets are often soft, but it’s always best to ensure you purchase the right model for your specific fish species. The best place to position a pond skimmer is an area with good surface flow where debris tends to collect and where the flow encourages debris into the skimmer more easily. In regards to a box skimmer, it’s common practice to place your submersible pond pump inside the box skimmer chamber, which will provide great flow from all corners. If you have a waterfall feature, placing your box skimmer in front of the waterfalls flow will provide extra movement and debris collection. A floating pond skimmer will move about naturally with the flow of your pond water, so won’t be stationary for long. This is useful as it helps prevent surface stagnation and can collect across a larger area of surface water. A submerged surface skimmer needs to be placed at a specific depth, so your options may be limited. Since water flows in a circular motion around your pond, an ideal place for this type of skimmer would be around an outer edge where the current is strongest. A sturdy and flexible skimmer box offering from Laguna which would suit both small and large ponds looking to clear surface debris. Lagunas pond skimmer features a sturdy box design and a filtration net basket which is easily removed from the top. Once buired you simply remove the basket directly from the top cover, making cleaning and maintenance very easy. The main chamber where you may house your submersible pump is quite large and allows room for customization. The skimmer is fish safe, and allows water regulation into the main chamber with its weir door design on the front. Lagunas pond skimmer is designed for pond pumps with a strength of between 2000 GPH and 4200 GPH, and would work well with most submersible pond pumps. Once your submersible pump is placed in the main chamber, you will feed the outlet hose through a small hole (fits 1 inch – 2 inch hosing) in the back right hand side of the box. Even though the skimmer works best with a pond pump rated around a minimum of 2000 GPH, it can be added to much smaller ponds with great results assuming you have a separate pump for the skimmer itself. The main basket net is large enough to hold plenty of floating debris and leaves, and we love how easy it is to remove and clean. One downside of the box skimmer is the roof is not quite as strong as we’d like, so if you’re considering adding rocks to disguise the box, you may need to add some extra support across the top to support the weight (i.e., a sheet of plywood). Our favorite pond skimmer box on the market! Atlantic Water Gardens Pond Skimmer series are super durable, easy to clean, and great at skimming pond water. This particular model features a 6-inch weir door which will accommodate both small and large ponds, and has been optimized for maximum water flow. The skimmer has been reinforced with a polyethylene interior for added durability, and due to this, is slightly larger and heavier than the Laguna pond skimmer. The skimmer has a large stainless steel supported mesh basket for debris collection which is easy to remove and clean from the roof of the unit. From testing the skimmer in a debris heavy pond, we were surprised at how much the basket holds and how easy everything is to remove and maintain! Included in the skimmer is an extra layer of sponge filter media which sits behind the basket to catch any smaller debris that may enter and also provides added biological filtration. A negative of the Laguna was that the roof was fairly fragile and adding rocks could cause damage. Atlantic Water Gardens skimmers have a very heavy duty lid with added steel bar support, so it’s perfect for adding natural rocks for camouflage. The lid is actually so strong is can also support some occasional foot traffic if it happens to be in walking path! To run this skimmer efficiently you will need a pump of around 2000-4600 GPH for a good water flow. The main chamber is large enough to accommodate most submersible pumps, and is easy to plumb with the outlet being in the back left corner (accepts 1 1/2 – 2 inch hose). The only issue we ran into when installing was it was fairly difficult to attach to the pond liner neatly, but after you have it in place, it works perfectly. Overall, a fantastic pond skimmer with very little in the way of drawbacks. Good skimming for both small or large ponds, as well as fish stocked ponds. The Oase AquaSkin pond skimmer is a free-standing skimmer which sits on your pond floor at a certain depth collecting debris. This skimmer is a great choice between a box skimmer and a floating skimmer, requiring less setup compared to a box and a higher capacity compared to a floating. The depth requirements are quite flexible, with the skimmer needing installation between 8 – 22 inches of depth. The best place would be on an outer edge of your pond where there is good water flow and where debris tends to collect. The skimmer does a good job of collecting debris, and is surprisingly powerful in comparison with its size. To power this skimmer effectively, you will need a pump rated at 1600-3500 GPH for a good flow rate. We found that a pump towards the higher end was more ideal, as the suction power drops considerably using a weaker pump. The only issue with this is the stronger the pump, the more chance your fish may get caught in the basket. If you have smaller goldfish, we recommend checking the basket daily just in case. The basket won’t hurt them while they’re trapped, but they’d be happier returned to the pond sooner rather than later! The skimmer is fairly easy to clean, and the basket has a good capacity for a compact skimmer. The only thing you will need to be cautious of is floating twigs, which can damage the impeller if they manage to get through the basket. Regular cleaning and maintenance is recommended. In conclusion, a powerful skimmer for small-medium ponds which has a great skimming rate when combined with a strong pump. A floating pond skimmer with a decent capacity and a good flow rate! One of the most common problems you see with floating pond skimmers is the lack of suction power and debris capacity, but this isn’t so much an issue with the Oase floating skimmer. The skimmer itself is fairly compact, and comes with a fairly strong 580GPH pump included. The skimmer has everything you need to get going, and requires no additional plumbing. Once started, the skimmer will sit neatly under the waters surface and slowly move and skim debris into its plastic basket. The basket is sturdy and quite generous for such a small skimmer, but will still need frequent cleaning if you have a lot of fallen leaves in your pond. The skimmer also includes a integrated aerator which provides extra oxygen to your pond water while it works. We found this works very well and is a welcome addition! The skimmer would be ideal for smaller ponds, but will unlikely be suitable for larger ponds or ponds with a lot of debris as the collection basket would become full far too quickly. We also had a few problems keeping the skimmer at surface level, as we found it sometimes collects air which rises it above the water level. If this happens you may need to give it a clean (if dirty) or hold it below the surface until it sits neatly on the waterline. If you find after using this skimmer you still need a little more skimming power, you can easily add another for double capacity! Overall, a nice little skimmer which should work great for smaller ponds. Hi very interested in you floating surface skimmer for a fish pond to deal with leaves and algae i have floating on surface. Would this Oase skimmer do the job? How big is your pond exactly? And how much debris are you dealing with? Floating skimmers are fantastic for smaller ponds (<1000 gallons), but may require frequent cleaning/emptying if you have a large pond with a lot of surface debris. If you don't have too much debris, or if you can perform a manual clean (using a net, vacuum, rake) beforehand, they're great at keeping the surface clear so debris can't build-up to extreme levels again.